The first photo you see upon entering Erin Munro’s website may make you feel as though have accidentally navigated into a game of hide and seek. The artist is seen skipping out of frame, a long mane of brown hair trailing behind her. For this reason, I wasn’t quite sure who to look for when going to meet with her. During the interview while staring into her bright, serious blue eyes, it occurred to me that it is possible that she chooses to remain hidden so that she will be judged for her art alone. I happened upon Munro’s film installation, Kaleidoscope Mandala, at Angell Gallery’s Summer Group Show, currently on display. 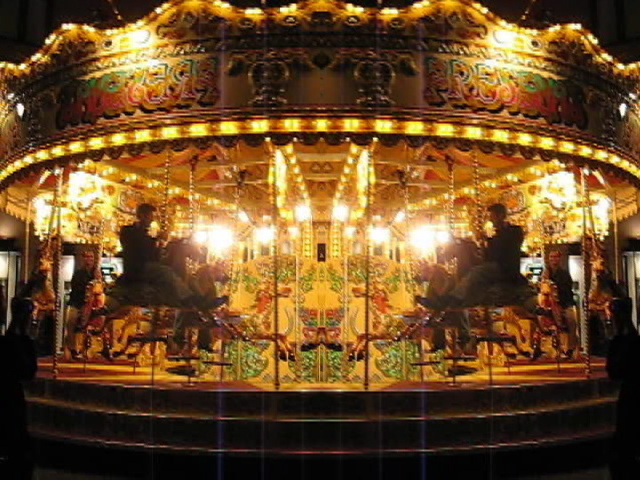 In the installation, what started as a single video-image of an antique merry-go-round has been transformed into a pair of mirror images folding into each other and disappearing into matching oblivions. This reflecting single-cell then divides repetitively until the screen is an array of colourful abstracted undulations. The beauty of the piece, Munro admits, is in its simplicity. The immediate associations to childhood and nostaligia from the ever-orbiting subject matter evoke deep symbolism from her uncomplicated editing. It seems that much of the beauty of Munro’s art arises from its simplicity. Munro’s paintings also bask in their uncomplicated beauty. Streaks of still-wet paint slide across her nocturnes as if Gerhard Richter had decided spruce up an old Whistler. Within another series, her ambient representations are so muted as to only resemble colour. Luckily for Munro, white paint often comes in the larger five-ounce tubes. I asked the artist, obviously versed in the painting tradition, how she came to work in film. For her, the progression was much more natural than I would have expected. To Munro, the faint blurs of melted subject matter that fall across the windows of her canvases represent the ephemeral nature of life. Rather than trying to portray the photo-still juncture in time praised by the realists, Munro is capturing moments using a much slower shutter-speed. While not endeavoring to show active movement, her goal seems to be in the passing, rather than the inert. With the idea of painting each instant bookended by it’s own past and future, transitioning to video was merely following intuition. She began experimenting with creating vaguely moving video-loops to project onto blank canvas. The original intention was to momentarily trick the art-gazer with this nearly motionless canvas. Her ease with working in video led her to delve deeper into the medium, exploring subtle suggestions of narrative and using personally created atmospheric soundtracks as accompaniment. It could be said that the mood of the work has the aura of spontaneity that one would expect from a girl trying to escape the front page of her own website. 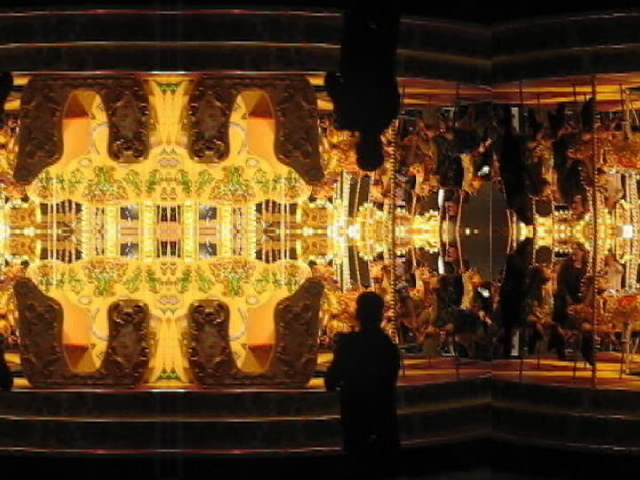 Erin Munro’s installation, Kaleidoscope Mandala, is currently on display at Angell Gallery until August 21, 2010.